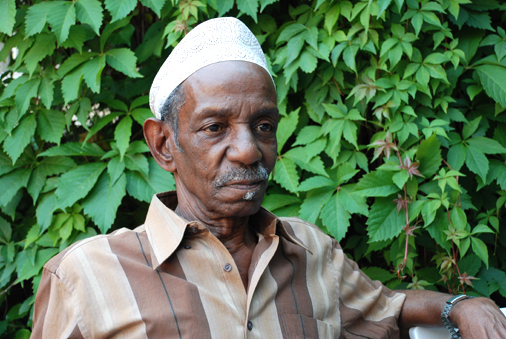 Swahili Poet Ahmad Nassir Juma Bhalo has passed on. The announcement was made on January 9, 2019. Ahmad Nassir Juma Bhalo was a Kenyan poet and healer born in Mombasa, Kenya in 1936. He is the older brother of Abdilatif Abdalla the chairman of the Mabati Cornell Kiswahili Prize. Ahmad Nassir Juma Bhalo was one of the most respected poets in the East African region. His work includes the poetry collection Malenga wa Mvita (Oxford UP, 1971) considered a modern classic, Poems from Kenya: Gnomic Verses in Swahili (University of Wisconsin Press, 1966) and Taa ya Umalenga (edited by Abdilatif Abdalla, Kenya Literature Bureau 1978). His epic poem Utenzi wa Mtu ni Utu (MacMillan, 1979) elaborates upon utu, the Swahili term for humanity and goodness, and presents a theory of morality in poetic form. Many of his poems have been popularised as songs by the Swahili taarab musician, Juma Bhalo. When the poet turned 80 in 2016, a ceremony was hosted in his honour that you can watch below. The poet and healer who died on 9th January 2019 was laid to rest in Mombasa. We here at JamesMurua.com mourn his loss and send condolences to his family and friends. Pingback: Celebrating heroes at the Swahili Literary Festival 2019. Previous Previous post: Ghana Association of Writers Literary Award 2018 winners announced.